We’re dedicated to improving patient care through education. 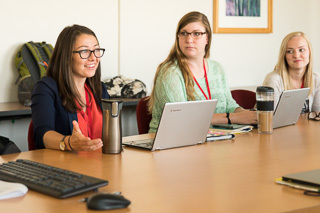 As part of this effort, ARUP’s genetic counselors host a three-week course for students in the University of Utah’s Graduate Program in Genetic Counseling (UUGPGC). Some of the ARUP genetic counselors are faculty in this program. This course was developed by ARUP’s board-certified genetic counselors and medical directors to provide students with hands-on opportunities to learn about testing methodologies, testing strategies, variant assessment, and interpretation of genetic test results while incorporating a patient’s medical and family history. Students are engaged in a variety of topics, including cytogenetics, maternal serum screening, noninvasive prenatal testing, biochemical genetics, and molecular genetics specialties as part of this rotation. They are exposed to unique content areas like pharmacogenetics, hemoglobinopathies, and newborn screening.